Dylan's mother, who was divorced from the pilot, stated that she did not know they would be flying on June 4th, 2017. She was aware that her son had previously flown in the airplane while seated in the front left seat. She further stated that she was never happy with the idea of her children flying with their father, and had been told that he had flown low over the accident site before, but after discussing the situation with legal counsel, concluded that there was nothing she could do to stop him from taking them. 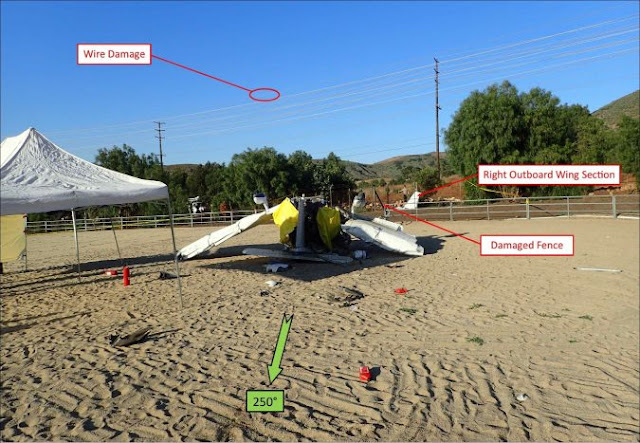 On June 4, 2017, about 1529 Pacific daylight time, a Piper PA-28-180 airplane, N4871L, collided with terrain in a residential neighborhood in Santa Rosa Valley, California. The commercial pilot and passenger, who was the pilot's son, were fatally injured, and the airplane was destroyed. The airplane was privately owned and was being operated by the pilot under the provisions of Title 14 Code of Federal Regulations (CFR) Part 91. Visual meteorological conditions prevailed, and no flight plan was filed for the personal flight, which departed Camarillo Airport (CMA), Camarillo, California, at 1513. 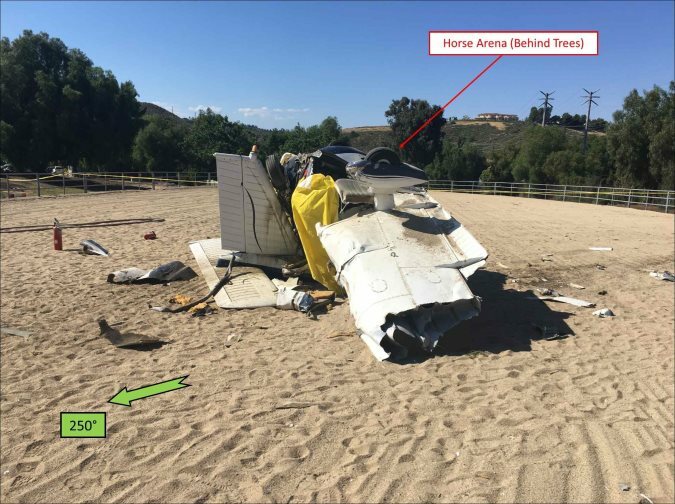 Air traffic control and radar information provided by the Federal Aviation Administration (FAA) indicated that the pilot contacted the CMA ground controller at 1506 and requested a right crosswind departure from runway 26. About 3 minutes after takeoff, the pilot was given a traffic advisory for an aircraft 1 mile ahead at the Saticoy Bridge. Radar data indicated that by this time the airplane was at a transponder mode C reported altitude of 1,600 ft and flying northbound. The pilot responded that he had located the traffic, and 1 minute later, the controller issued the pilot a frequency change to the Point Mugu Radar Air Traffic Control Facility for flight following. The pilot acknowledged, but did not contact Point Mugu; there was no further communication recorded with the accident airplane. About 1525, the pilot's daughter was on her horse in an outdoor horse arena 14 miles east of CMA. She was accompanied by two riding instructors; one who was at her side, and another in an adjacent wash rack area next to a barn. Both instructors reported seeing an airplane approach from the northwest and fly over the arena in a southeast direction. The airplane then began a 180° left turn, tracking back past the arena to the northwest. 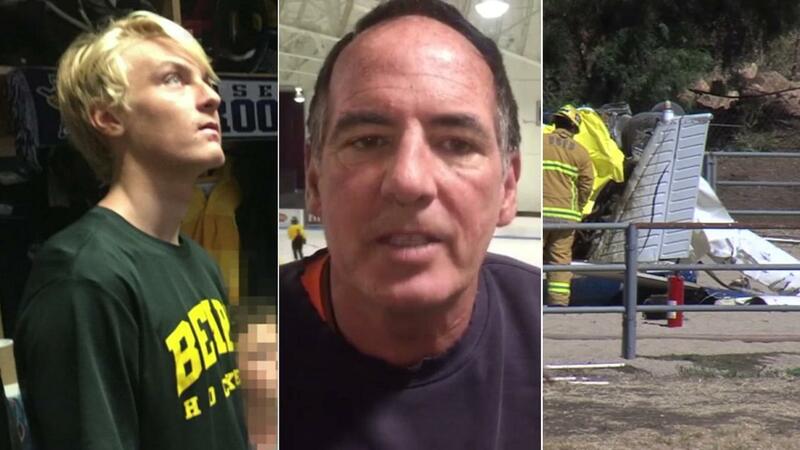 They later told investigators that the father had flown the airplane over the arena before, and although they could not definitively judge the airplane's altitude, it was about the same as on those previous occasions. The airplane continued northwest for about 1/3 mile, and as it overflew a house on top of an adjacent hill, it began to turn left. The riding instructors reported that the engine started to "sputter," then stopped producing sound. The airplane continued the turn until it was traveling southeast again. The instructors heard the engine sound increase as the airplane flew directly toward the arena at a much lower altitude than before. The airplane continued to descend with the engine operating and flew directly overhead and over the arena about 100 ft above the ground, startling the horses. The pilot's daughter stated that she was facing west when she first observed the airplane. The airplane was flying toward her, and although she did not see who was onboard, she stated that she knew it was her father. She was aware that he and her brother were flying that day and was under the impression that they would be flying to the Channel Islands. The airplane circled overhead two or three times, and everything sounded and looked normal. However, on the final pass, as the airplane flew toward her, the engine sound stopped, and the airplane began to rapidly descend. It was much lower than before, and as it approached, she was concerned that it might scare the horse and that she might be thrown off. She stated that, just as the airplane flew overhead, the engine sound started again, and the airplane turned right behind the trees and out of her view. She then heard the sound of a crash. The daughter reported that she had flown with her father about 15 to 20 times, and about three weeks before the accident, he flew over the same area but at a higher altitude. He had told her he knew about the power lines and always mentioned that they were "a pilot's worst enemy." Another witness, located on the accident property, stated that the left turn following the initial overflight was very aggressive, and that the engine was operating at that time. As the airplane came in for the second pass toward the arena, he was shocked at how low it was flying. After overflying the arena, and just above the tree line, the airplane pulled up before reaching the power lines, and immediately rolled aggressively to the right. 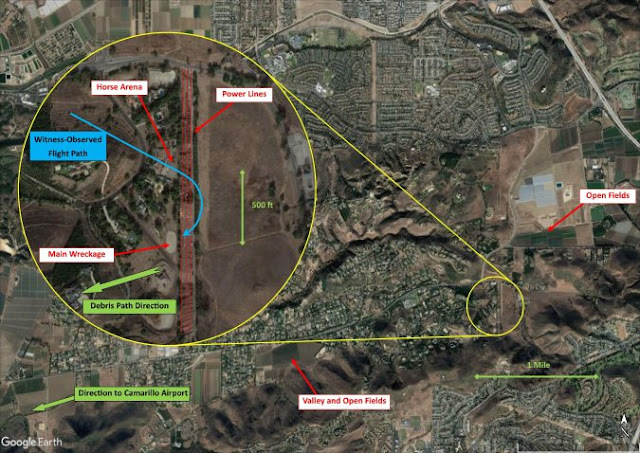 At 1532, the pilot of a Cessna 172 reported on the CMA tower frequency that he had just observed a small airplane crash while the airplane was performing low-level maneuvers in the Moorpark area. The pilots onboard the Cessna 172 subsequently provided statements indicating that they were at an altitude of 2,500 ft mean sea level (msl) about 14 miles east-northeast of CMA when they observed an airplane below them, and just south of their position. It was flying back and forth, very low, and performing banking maneuvers that one of the pilots described as "crazy eights." One pilot stated that she was familiar with the undulating terrain and was concerned that the airplane was going to crash into the hillside. The other pilot stated that, every time he looked over, the airplane was flying in a different direction, and that it was so low that he could see its shadow on the ground. They continued to watch as the airplane, while traveling at high speed, made a final "hard right bank," circled back around, and impacted the ground. The pilot, who was seated in the front right seat, held a commercial pilot certificate with ratings for airplane single-engine land and sea, airplane multiengine land, and instrument airplane. The pilot's most recent third-class FAA medical certificate was issued on January 28, 2016, with a requirement to have available glasses for near vision. He had reported no medical conditions and no medications on his application. No flight logbooks were recovered for the pilot. At the time of application for his medical certificate, he reported 1,989.9 total hours of flight experience, including 43.2 hours in the previous 6 months. One of the airplane's co-owners stated that, although the pilot did not own a share in the airplane, he started flying it about 3 years before the accident and typically flew it one or two times per week. 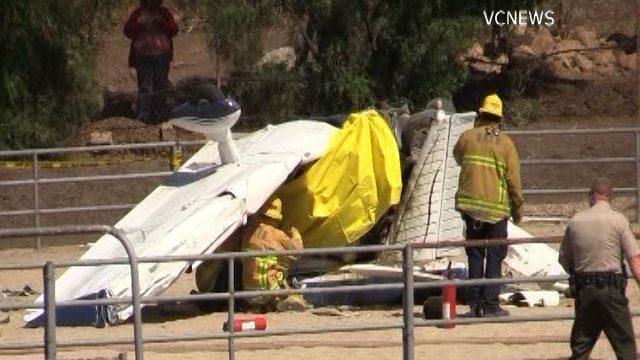 He estimated that the pilot had about 500 hours of flight experience in the accident airplane make and model. The pilot's 15-year-old son was seated in the front left seat of the airplane. He did not hold a pilot certificate, although according to family members, he often sat in the left seat when flying with his father. His mother, who was divorced from the pilot, stated that she did not know they would be flying that day. She was aware that her son had previously flown in the airplane while seated in the front left seat. She further stated that she was never happy with the idea of her children flying with their father, and had been told that he had flown low over the accident site before, but after discussing the situation with legal counsel, concluded that there was nothing she could do to stop him from taking them. The airplane was manufactured in 1967 and was equipped with a Lycoming O-360-A4A engine, which was last overhauled in 1992. The most recent maintenance event was for an annual inspection, which was completed on February 1, 2017. At that time, the airframe had accrued 5,939.9 total flight hours, and the engine 1,796.4 hours since major overhaul. The airplane was equipped with dual cockpit flight controls. At 1555, the automated surface weather observation facility at CMA, elevation 65 ft mean sea level, reported wind from 250° at 5 knots, 10 miles visibility, temperature 70°F, dew point 61°F, and an altimeter setting of 29.86 inches of mercury. Using these values, the density altitude at the accident site was about 1,700 ft. The airplane came to rest in the middle of a horse arena, which was 175 ft long and 85 ft wide, and oriented north-south. The arena was at an elevation of 590 ft msl and situated within a geographic bowl-like depression, flanked about 1/3 mile to the northwest by a 790-ft-tall hill, and by 1,030-ft-tall hills at a similar distance to the south and east. About 1,000 ft to the west of the arena, the terrain rose to about 770 ft, then gradually fell away through the Santa Rosa Valley before reaching CMA, 13 miles to the west. The Channel Islands were about 28 miles beyond CMA. The area surrounding the accident site was interspersed with hills, fields, and densely-populated housing developments. Open agricultural fields were located at an elevation of 625 ft about 1/2-mile northeast. Fields were also located at an elevation of 310 ft about 1 1/2 miles southwest. The arena was bordered to the east by three separate sets of power transmission lines oriented north-south. The lines were positioned about 60, 85, and 180 ft east of the arena edge. The closest two sets of lines were about 65 ft above ground level (agl), with the farthest line about 75 ft agl. The horse arena where the airplane crashed and the arena that the airplane initially overflew were separated by 50- to 80-ft-tall trees (See Figure 2). The first identified point of impact was a metallic 4-ft-long transfer mark on the power line closest to the arena (See Figure 3). The outboard right wingtip and aileron section was located about 30 ft south of the mark and exhibited striation marks on the wing leading edge, consistent with power line contact. The steel railings on the eastern edge of the arena were crushed and fragmented, and a fan of debris consisting of oil, the gascolator, and plexiglass and composite fragments extended on a heading of 250° toward the main wreckage. The airplane came to rest about 120 ft southwest of the initial power line impact point. The empennage was largely intact and upright. The forward cabin area had folded back over and under the aft cabin, leaving the wings inverted and the engine resting on the top side of the aft tailcone. The leading edges of both wings sustained crush damage along their entire length. A faint smell of aviation gasoline was present at the site by the time investigators arrived about 2 hours later. 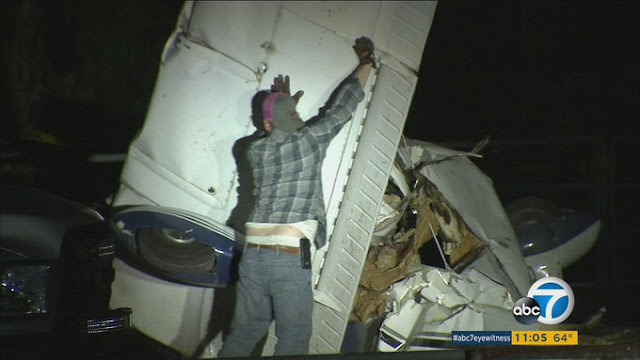 The airplane and engine were examined both at the accident site and 8 days later at a recovery facility. A complete examination report is contained within the public docket; the following is a summary of pertinent findings. The fuselage sustained extensive crush damage through to the tailcone. Both wings sustained leading edge crush damage about 90° relative to the direction of travel. Outboard of the fuel tanks, the damage displayed an accordion-like appearance. The wing tanks displayed bulging damage, consistent with hydraulic deformation, with both tanks breached at their outboard rib seams. The right wing remained attached and the left wing had completely separated from the fuselage at the wing root. Both flaps remained attached to the trailing edges of their respective wings. The aileron cables for both wings remained attached to their respective bellcranks. Movement of the cables at the wing root resulted in corresponding movement of the aileron inboard rib. The tab of the stall warning switch in the left wing was crushed against the wing leading edge. Subsequent testing of the switch assembly revealed that it was operational. The pitot mast remained attached to the underside of the left wing. The associated ram air and static lines were free of obstruction from their separation point at the wing root through to the mast. The empennage was largely intact, and the rudder and stabilator cables were continuous to the main cabin. Movement of the cables at the cabin resulted in corresponding movement of their respective control surfaces. The rudder remained attached to the vertical stabilizer at all of its hinges. The stabilator trim drum exhibited 5 exposed threads on the top, consistent with a neutral pitch trim position. The cockpit controls, along with all instruments and avionics, were crushed and fragmented. Both fuel tank caps were in place and undamaged at their respective filler necks; the cap gaskets were pliable, and the fuel supply screens were free of debris. The supply and vent lines were clear, and the fuel drain for the left tank was in the closed and locked position, and did not leak when tested. The fuel drain for the right tank appeared to have sustained damage consistent with impact and was broken away at the tank fitting. The fuel selector valve was found in the left tank position. The valve handle felt stiff when moved, although once moved, the detents could be felt. The valve was functionally tested in each position and passed air appropriately. Disassembly of the valve revealed radial score marks to the valve body and cavity, and light, tan-colored fragments of material broke away from the valve seal. The O-ring at the top of the valve was intact and pliable. The fuel lines from the selector valve to the carburetor sustained extensive disruption and multiple breaches. All lines appeared to be free of obstruction, and no traces of fuel were found. The engine remained attached to the firewall and had folded aft and over the top of the instrument panel. The carburetor remained attached to the inlet manifold, which separated from the engine. The carburetor was disassembled following recovery and no fuel was present in any of the lines, the bowl, or the accelerator pump chamber. The brass floats were intact and undamaged. There was no foreign debris observed within the bowl or accelerator pump chamber. The accelerator pump seal was intact and pliable. The fuel inlet line had broken away from the carburetor case, and the inlet screen was clear. The propeller remained attached to the crankshaft flange. The nose cone base plate was crushed around the hub and both blade roots. One of the blades was intact, free of significant damage, and exhibited leading edge polishing, with smooth abrasions in the paint radiating about 45° relative to the leading edge. The second blade was curved about 90° aft along its entire span; the blade exhibited polishing and paint abrasions almost perpendicular to the chord. Oil was present in the crankcase, the engine could be rotated by hand from accessory drive input, and borescope examination did not reveal any catastrophic internal failures. Both magnetos were intact and operated appropriately when tested. 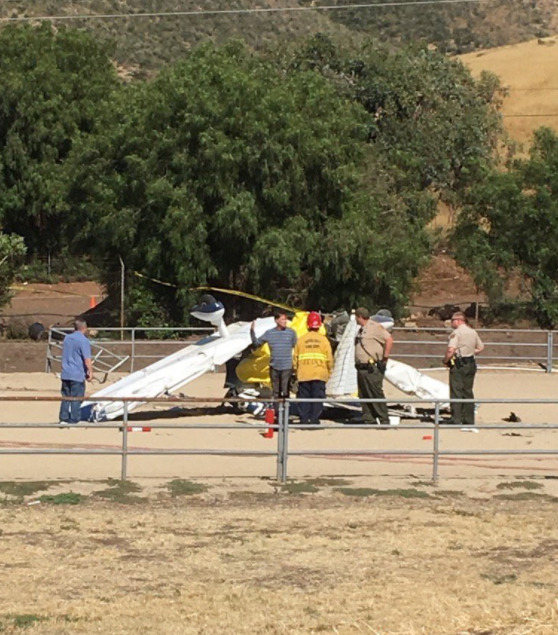 The Ventura County Medical Examiner's Office, Ventura, California, performed an autopsy of the pilot. The pilot's cause of death was multiple blunt force injuries. No significant natural disease was identified. The FAA's Bioaeronautical Sciences Research Laboratory performed toxicology testing on specimens of the pilot, which identified alprazolam and its metabolite, Alpha-hydroxyalprazolam; gabapentin; and tetrahydrocannabinol carboxylic acid, a metabolite of tetrahydrocannabinol (THC), the active compound in marijuana, in urine and liver tissue. THC was identified but not quantified in lung tissue, but testing of liver and kidney tissue for THC was inconclusive. Finally, ibuprofen was identified in urine. Alprazolam is a benzodiazepine available as a Schedule IV controlled substance via prescription used to treat anxiety and panic disorders and is commonly marketed with the name Xanax. It carries the warning, "Can cause paranoid or suicidal ideation and impair memory, judgment, and coordination. Combining with other substances, particularly alcohol, can slow breathing and possibly lead to death." Gabapentin is a prescription medication used to treat nerve pain and prevent seizures and is commonly marketed as Neurontin. Gabapentin increases the risk of suicidal thoughts and is a central nervous system (CNS) depressant. It carries the warning, "Patients should be advised that gabapentin may cause dizziness, somnolence, and other symptoms and signs of CNS depression." Both alprazolam and gabapentin are disqualifying for aeromedical certification. THC is the active component in marijuana, a Schedule I controlled substance; tetrahydrocannabinol carboxylic acid is an inactive metabolite. THC causes mood- altering effects, euphoria, and relaxation for a few hours after use. In research involving actual flying and/or use of flight simulators, impairment for up to 24 hours was noted following smoking marijuana. Of interest was the lack of pilot awareness of impairment or decreased performance in those studies. Ibuprofen is an over-the-counter analgesic often marketed with the names Advil and Motrin. It is not considered impairing. The pilot's personal medical records indicated that he visited a doctor after complaining of minor ailments including a cold, but there were no records indicating that he had been prescribed alprazolam or gabapentin. The fixed base operators (FBOs) at local airports, including CMA, were contacted in an effort to determine the last time the airplane was serviced with fuel. None of the FBOs could provide evidence indicating that the airplane had been recently fueled; however, some did not record airplane registration numbers, but rather credit card numbers and their associated names only. The pilot's brother reviewed the pilot's credit card statements, and the last time he used his credit card to purchase fuel was in January 2017. However, the brother stated that the pilot often purchased fuel with cash. According to one of the airplane's co-owners, the standard protocol required that the last pilot to fly the airplane was required to top it off with fuel. This protocol was adhered to by all who flew the airplane. The co-owner stated that the one time the accident pilot was unable to service the airplane with fuel, he immediately called the owners to apologize. The co-owners reported that the pilot was the primary operator of the airplane over the months leading up to the accident, and that they did not keep a flight log. The airplane flight manual indicated a flaps up, power off stall speed of 67 mph calibrated airspeed. At bank angles of 40°, 50°, and 60°, the stall speed increased to 76, 83, and 94 mph, respectively. Due to the vintage of the airplane, glide distance data was not included in the original flight manual. According to the PA-28-180 flight manual for a similarly equipped 1974 version of the airplane, the glide distance with the propeller windmilling, flaps set to 0°, and an airspeed of 85 mph was about 3.75 miles from an altitude of 2,000 ft agl, and about 1.7 miles from 1,000 ft.
Based on the airplane's final location (600 ft from its initial overflight track) and the fact that it came to rest on an almost reciprocal heading, the turn radius prior to impact was likely about 300 ft. According to the publication, "Aerodynamics for Naval Aviators" (NAVWEPS 00-80T-80), Figure 2.29, General Turning Performance (Constant Altitude, Steady Turn), the bank angle required to maintain a turn radius of 300 ft, at a true airspeed of 73 knots (85 mph), would have been about 58°. At 100 mph, the bank angle required would be about 66°.